Eugene Hernandez: “Breaking Upwards”. Breaking even? Eugene Hernandez: "Breaking Upwards". Breaking even? New York, NY, March 29, 2009 — A few hundred film folks spent much of a sunny New York City Saturday indoors at Columbia University this weekend. Dubbed, “The Conversation,” the all-day symposium at Columbia’s Uris Hall was the latest event aimed at exploring the future of the entertainment industry, particularly for emerging and indie movie makers. Throughout the day filmmakers seemed at odds over a number of issues. Case in point, some resist the idea that they need to spend more time marketing and distributing their own movies. Others reject advice that they should to consider their ultimate audience for a movie, and sometimes distribution plans, even before they start shooting their films. Still others in attendance groused that journalists are spending more time focusing on the business and process of making and releasing movies, rather than the films themselves. Like it or not, generally speaking, fewer companies are paying sizable advances to buy rights for films. Distributors are often spending less money to market their films. So, what’s an indie filmmaker to do? How do you sustain yourself? At least a few ingenious (sometimes well-off) filmmakers are finding clever ways to monetize their personal, low-budget movies. Along the way, a growing roster of case studies, coalitions and tools may emerge to help the next set of directors focus more on the art than the commerce. 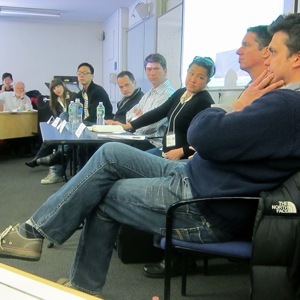 Panelists during a session at this weekends conference, “The Conversation,” held at Columbia University. Pictured: moderator Laure Parsons, Ryan Werner from IFC Films, Davin Hutchins from IndiesLab, Adam Chapnick from Distribber, Scilla Andreen from IndieFlix, Jim Flynn from EZTakes and Matt Dentler from Cinetic Rights Management/FilmBuff. Photo by Eugene Hernandez/indieWIRE. Opening in New York City and on VOD this week (with more theatrical cities to follow), the 2009 SXSW title was showcased with a whopping full newsprint page profile in the New York Times on Sunday morning. But, the exposure came at a cost. Will the article, as well as other media attention and guerrilla outreach from the filmmakers themselves, be enough to put the film over the top with audiences? According to the Times feature, Wein and his co-writer/producer/star Zoe Lister-Jones flipped their $40,000 advance from IFC Films and invested it into building a release plan (and awareness) for their feature film. During a panel discussion at “The Conversation” this weekend, IFC’s marketing VP Ryan Werner said that indie films and romantic comedies are the hardest to market on the VOD platform. “Breaking Upwards,” an indie romantic comedy without big name actors (its leads are the twenty-something filmmakers themselves), would seem disadvantaged. When pressed, Werner added that 25,000 transactions is considered a modest success for a VOD title. I was in the room when he used that figure and others in the audience at the session reported the number on Twitter almost immediately. But, what does it really mean? While its understood that genre films and those with stars perform much better on VOD, another panelist added that films with a title beginning with one of the first letters of the alphabet tend to do better on the platform because they are easier for consumers to find via the on screen guide. Apparently, “Breaking Upwards” will benefit from its title alone. Now, armed with these tidbits of information and based on my emerging understanding how the VOD business is evolving, I sat down with a calculator yesterday to ponder whether “Breaking Upwards” has a shot at breaking even. First a disclaimer: I’ll admit that I’ve yet to see “Breaking Upwards.” I will either catch it on VOD soon or watch it on a big screen later this week. And, for this column, I decided it would be better *not* to reach out to the filmmakers or IFC Films for data and insight, because talking numbers — especially at this stage before a film has opened — typically makes everyone uptight. So, I’ll just respectfully use the information and data shared on Saturday’s panel and in yesterday’s New York Times article about the movie. Can “Breaking Upwards” break even? The short answer: It seems to have a decent shot. According to the New York Times, “Breaking Upwards” cost $15,000 to shoot. Unknown are the additional amounts required to clear music and deliver the film to distributor IFC Films. There’s no way to estimate such numbers based on the information readily available. However, we’re told that the filmmakers are taking their $40,000 advance from IFC Films to support their theatrical release. In exchange for that fee, they’ve most likely sold rights to their movie to IFC for at least ten to fifteen years. PR firm Falco Ink, hired to promote the movie, is apparently getting part of that fee. Way back in mid-November, I received my first email about “Breaking Upwards” from a Falco publicist, seemingly hired by the filmmakers themselves. So, for the sake of this exploration, let’s assume — as is implied in the NY Times article — that they are not keeping any of that $40,000 advance. IFC Films’ costs for the movie — on top of the minimum guarantee for the filmmakers — could be as much $50,000 or more. That’s just a guess: $25,000 to encode it for VOD? A distribution fee at $25,000 to cover their own overhead, publicity, promotion, etc? That’s certainly customary. These seem to be standard costs for such a release these days. Maybe more? The filmmakers and the distributor could certainly be spending even higher amounts on this release. So, the film is now available on VOD at a price point of $5.99 standard definition and $6.99 high definition. I don’t know the typical standard versus high def split for VOD customers, so I’ll just calculate a $6 digital price point for the movie rental. And, based on data gathered from other panel discussions in recent months, it’s safe to estimate that about half of that amount goes to the cable operator. That’s $3 per customer to be delivered to IFC Films. That means, 30,000 people need to buy “Breaking Upwards” on VOD for IFC Films to make back my own estimated costs of its initial release of the film ($40K advance + $50K additional costs). That’s a bit higher than Ryan Werner’s aforementioned 25,000 number for a modest VOD success. Once it makes back the distributor costs and the revenues exceed the minimum guarantee, the buyer and the filmmaker would split additional revenues per their sale agreement. Now, these potential revenues are from the VOD window alone. Not included in my calculation are theatrical revenues for the movie. And, unknown is whether it will also be released on DVD and in a subsequent cable TV window, not to mention foreign sales. Thus my assessment that “Breaking Upwards” has a shot at breaking even. Whatever other projects Daryl Wein and Zoe Lister-Jones have on their plate, though, they’ve invested time and money in the hope that when all is said and done the costs will pay off somehow, either as a calling card, a business investment, or both. This year at indieWIRE, we’ll take even closer looks at films and filmmakers who are pursuing a variety of approaches. What’s working and what isn’t? What are the lessons learned? We invite producers, directors and distributors to work with us to tell these stories. How can we arm more filmmakers with knowledge and numbers to that they can make smart decisions, knowing that each film’s story is unique and each situation is different. Over lunch recently, another emerging filmmaker related that an approach similar to the one being taken by Wein and Lister-Jones generally makes the most sense when the costs of a film are ultra low. A combined digital and theatrical release, bolstered by national media attention, can boost the awareness of a movie and position it well. While it can pay back over time, don’t quit that day job. The are no guarantees. The filmmaker told me that he traveled the festival circuit and then promoted his film for months to lay the foundation for its eventual release, hurting his own cash flow along the way. The director was scrambling for odd jobs to pay the rent in the wake of his release, having invested his advance from a film distribution company back into his own movie. The good news is that he made a really good low budget film that he will profit from financially over time. The bad news is that he’s never been so broke. After our talk, I paid for our lunch and he headed off to a meeting with a potential client who, based on the notoriety of his first feature, might hire him to re-write a screenplay for a sizable sum. Eugene Hernandez is the Editor-in-Chief & Co-Founder of indieWIRE and can be followed on Twitter: @eug or through his indieWIRE blog.